Brothers, I would like to update you on an item from the last issue of Hibernian Digest. 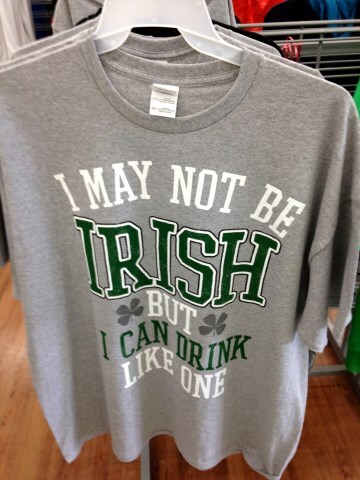 As you will recall Walmart was selling several shirts fostering negative stereotypes and promoting ignorant misrepresentations of Irish Americans. Among the items sold was a shirt “I May Not Be Irish, but I Can Drink Like One”, another “Blame the Irish for My Behavior” and finally what has to be the hands down winner in the questionable judgment/bad taste award the shamrock festooned “Irish I Could Drink” Maternity top. We had sent a letter on February 24th and were acknowledge with a case number that same day. With more than 140 million people shopping our stores each week, we inevitably encounter a wide variety of viewpoints with respect to the merchandise we sell. We take our customers’ feedback seriously and incorporate it into our product selection. As such, we made a point to ask for our customers’ input on our St. Patrick’s Day merchandise several months before finalizing the items that we would carry. We have since asked Ms Huff-Wolley under what mechanism were “customers asked for input” and approved such denigrating bigoted items as the “I May Not Be Irish, but I Can Drink Like One” shirt. Not surprisingly, given our past experience, we have not heard a response back. Brothers, it is up to us an all proud Irish Americans to provide our input to Walmart concerning denigration of our heritage. Let’s give Walmart true input on what real Irish American think about merchandise that promotes negative images of Irish Americans for profit. If enough of us let our voices be known now we can prevent further negative targeting of Irish Americans and their heritage.